An important update for the FieldClimate Android mobile app is available on the Play Store. The new version has a refreshed design and is much faster because it is based on our new database and API system. 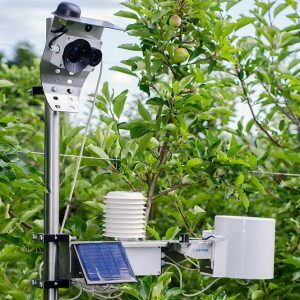 µMETOS LoRa is a new generation of the METOS weather stations that operate on the LoRa network that will help bring down hardware prices, optimize data transmission costs and bring connectivity to previously unreachable areas. The development of the device continues with tests in the field. We are happy to announce that Pessl Instruments and Ris Iberia from Spain will be creating a joint venture to expand business in all agricultural verticals and answer to the demands of a fast growing Spanish agricultural sector. We are happy to announce that Pessl Instruments and Field Systems from Australia will be creating a joint venture to expand business in all agricultural verticals and answer to the demands of a fast growing Australian agricultural sector. The Philippines has been tagged as the 13th most climate-vulnerable out of 186 countries. To help local farmers deal with the effects of climate change, technology will play a key role in promoting resilience in the agriculture sector. We are proud to announce that Pessl Instruments will be a partner in the ImPACT (Improving Productivity in Agriculture through Climate-Smart Technology) project in the Phillipines. By introducing the METOS system to smallholder rice farmers, we hope to lay the groundwork towards an overall improvement in food security in the Phillipines. Farming has become more challenging than one can imagine. A constantly increasing need to sustainably boost productivity, to adapt to the ever-changing weather conditions, to optimize soil and water management, while at the same time managing to keep up with market demands sounds almost like a mission impossible. But we have proof that it is not so. First things first! We are happy to say that the presentation of Yara-Pessl Instruments joint solution for plant water management at the NewAG Berlin Conference was a success. Thank you, everybody who took time to visit us at the booth! Due to opposing views on the development and marketing of automated insect monitoring device, EFOS and PESSL INSTRUMENTS jointly decided, that PESSL INSTRUMENTS shall not further distribute Trapview products (sometimes also labelled as “TrapV” or “iTrap”). Moreover, until the 30th of September 2017 PESSL INSTRUMENTS shall not sell or supply any insect monitoring device which would serve same or similar functionality as Trapview. All customers currently using “Trapview” products are kindly advised to contact EFOS (Trapview) directly at sales@trapview.com or support@trapview.com. The Joint Solution of Pessl Instruments and Yara for Plant Water Management has been announced at the end of last year. Now – just before the start of a new season, we are happy to say that delegations of both companies will be attending the NewAG International Conference next week in Berlin (15-17 March) and will be available to answer your questions. For this occasion we have also prepared a leaflet to give you more information on the solution that will be presented in Berlin. You can get it by clicking on the picture below. It seems like we just stored last season’s goods and it is already March with all the final planning, organizing and plotting in place for the next. The needs of world population are changing; there are more and more people that need to be fed and on the same acreage as before. So how do we do that? Start building gardens in the sky? Connected. Dynamic. Always changing. Mobile. As usual, November is the busy part of the year for us – the harvest marks the end of work in the field and means the beginning of the “indoor season” with all the fairs lining up one after the other, all over the world. Greetings from the first partner meeting on Iberian peninsula! Strawberries with cream and chocolate? Blueberry muffin? Raspberry cheesecake? We love them all! And it seems like our love for them will keep on growing. Berry Very much. A field – the main asset of every crop grower. But do we really know what is happening in it? Are we able to harness the data and benefit from it? We spoke with Mr Branko Majerič who certainly can. The story begins in Slovenia – the only country with “LOVE” in its name. Located in the middle of Europe, just south of Austria – we are visiting the Majerič farm on the Ptuj field, in the village of Moškanjci. Netherlands. Almost 34.000 km2 of land and more than 7.600 km2 of water. It is the fifteenth smallest country in Europe, but at the same time the second biggest exporter of agricultural products, with a realtively strong market of high value crops, like seed potatoes, flowerbulbs and vegetables is also relatively strong. But let’s focus on flowers. On tulips grown for buds and bulbs and how and how iMETOS statons help them grow stronger. The last week of June. In short: a very busy week for Pessl Instruments team travelling around South-East Asia. When we talk about iMETOS, we often focus on farmers and how they can benefit from setting up a station on their land; saving the resources, improving farm management, knowing exactly what is happening in the field and acting on it. But they are not the only ones who can do a better job using real-time on-site data. We live in the age when all things are becoming smart(er), wireless and more connected. What only 20 years ago seemed like an idea from a science fiction movie has become a reality. According to the International Energy Agency, there will be more than 14 billion IoT enabled devices, turning from people-operated computers towards autonomous smart devices. We are proud to announce a partnership with Calata Corporation, one of the biggest agricultural conglomerates in the Philippines, with the goal of introducing data driven farming practices to the Philippines agricultural sector. What is 3 years for nature? Close to nothing. And for a farmer? Three springs of hard work. Three summers of hoping for rain to come or go away. Three harvests. Three winters of thinking about the next season. How to grow more and better. How to lower expenses and prevent crop loss. How to sleep lighter. Making world a better place. Achieving better future. Ending extreme poverty. Fighting inequality and injustice. Protecting our planet. Defining the world we want – together. GEOSYS, a leading global provider of agronomic decision support tools, announced a global partnership with Pessl Instruments GmbH to add local weather data to its satellite imagery and weather model-based offerings. Collaboration enables local weather station data to be incorporated into GEOSYS products. Fertimetro, a new a sensor for the soil fertility estimation, will also be presented at Fruit Logistica. It is an invention patented by the University of Padua and is compatible with iMETOS 3.3. Last week, our team spent 2 days at Global Forum for Innovations in agriculture in Durban, South Africa. We are happy to say that the event was a great success for us and our African colleagues. Among many visitors who stopped by our booth, we are proud to say that also, His Excellency, Tony Nsanganira, the Minister of State in Charge of Agriculture for Rwanda (second from the left) took his time to visit us. Metos USA, a full subsidiary of the Pessl Instruments, organised the first USA distributor meeting and training in Watsonville – CA.